A U.S. merchant seaman takes aim during training to repel pirates in the Strait of Malacca, 1984. 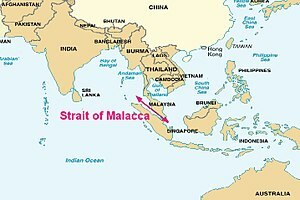 Piracy in the Strait of Malacca has historically been an unresolved threat to ship owners and the mariners who ply the 900 km-long (550 miles) sea lane. In recent years, coordinated patrols by Indonesia, Malaysia, and Singapore along with increased security on vessels have sparked a dramatic downturn in piracy, according to the International Maritime Bureau (IMB). 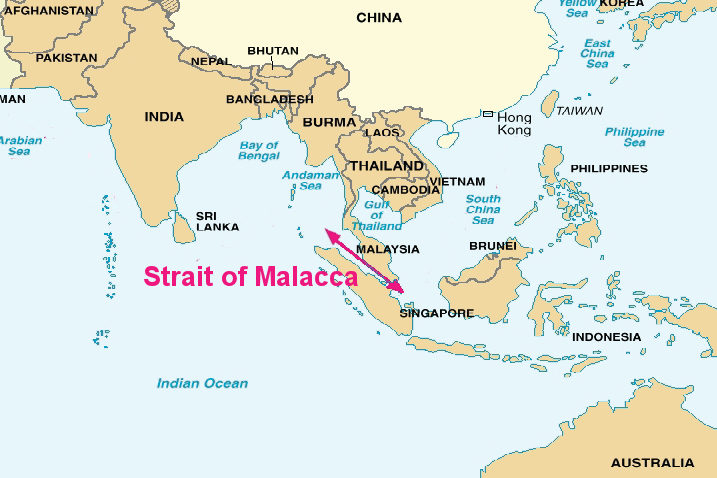 The Strait of Malacca's geography makes the region very susceptible to piracy. It was and still is an important passageway between China and India, used heavily for commercial trade. The strait is on the route between Europe, the Suez Canal, the oil-exporting countries of the Persian Gulf, and the busy ports of East Asia. It is narrow, contains thousands of islets, and is an outlet for many rivers, making it ideal for pirates to hide in to evade capture. Historically, piracy in the Strait of Malacca was not only a lucrative way of life but also an important political tool. Rulers relied on the region's pirates to maintain control. For example, it was through the loyalty of pirate crews made of Orang Laut people that the 14th-century Palembang prince Parameswara survived expansion attempts by neighbouring rulers and eventually went on to found the Sultanate of Malacca. Between the 15th and 19th centuries, Malaysian waters played a key role in political power struggles throughout Southeast Asia. Aside from local powers, antagonists also included such colonial powers as the Portuguese, Dutch and British. A record of foreign presence, particularly in the South China Sea and the Strait of Malacca, is found today in the watery graves of sailing vessels lost to storms, piracy, battles, and poor ship handling. The 18th and 19th centuries saw an increase of piracy in the strait as European colonisers arrived in the region, spurred in part by the economic imperative to control the lucrative spice trade. According to Charles Corn, author of The Scents of Eden: A Narrative of the Spice Trade, "Spices drove the world economies in those days the way oil does today." Increased commercial traffic through the strait and the local populations' poor economic conditions drove many people to piracy. Piracy was also sometimes used as a form of political resistance to colonialism. Pirate crews often came from the Lanun people native to the coastal villages in the region. Chinese pirates, outcasts from Qing dynasty China, also preyed on unsuspecting trading ships. In the 1830s, the controlling colonial powers in the region, the British East India Company and the Dutch, agreed to curb the rampant piracy. They drew a demarcation line along the strait and agreed to fight against piracy on their own side of the line. This demarcation would eventually become the modern-day border between Malaysia and Indonesia. Increased patrolling and superior seafaring technology on the part of the European powers, as well as improved political stability and economic conditions in the region, eventually allowed the European powers to greatly curb piracy in the region by the 1870s. The International Maritime Bureau (IMB) reports worldwide pirate attacks fell for the third year in a row in 2006. Attacks on ships at sea in 2006 fell to 239 vessels, down from 276 in 2005. That same trend echoed in the Strait of Malacca where attacks dropped from 79 in 2005 to 50 in 2006. Nonetheless, in 2004, the region accounted for 40% of piracy worldwide. The IMB reported in October 2007 that Indonesia continued to be the world's most pirate-struck region with 37 attacks since January 2007, though that was an improvement from the same nine-month period in 2006. The September 11 attacks also heightened the perceived threat of terrorism-related piracy, but U.S. Maritime Administration (MARAD) experts distinguish terrorism from piracy, and piracy from shore gangs who rob ships in port. Some observers argue that there is no single problem of violence at sea, but rather a collection of problems, and that different kinds of violence require different defenses. Technology is being used to combat pirates, in addition to air and sea patrols. For instance, the IMB's 2006 annual report notes that since July 2004 vessels of 500 gross tons or more have to have security alert systems on board. Security systems include near-real-time ship location devices. Furthermore, the Federation of ASEAN Shipowners' Associations has launched a database system to provide updated information on location, types of attacks, and outcomes. The system, called the "Information Sharing Centre (ISC)", is part of a 14-nation pact to combat pirates. According to the Singapore Transport Ministry's Permanent Secretary, "Piracy is a transnational problem and this is the first time an international body has been set up to deal solely with the problem of piracy in Asia." Violent, armed pirates robbing crews at sea get attention-getting headlines, but the direct economic impact of robbery at sea is small relative to the volume of global trade in the area. Typical pirate booty is limited ship's stores, engine parts, and crew members' cash and personal property. But piracy also has indirect costs, including increased security measures and spikes in shipping insurance premiums. For instance, Lloyds of London declared the strait a high war-risk area for insurance purposes, underscoring the Strait of Malacca's outlaw reputation in recent years. The action added a premium of 1% of cargo value, "infuriating shipping lines", according to news reports. The declaration of the sea lane as a high war-risk area referenced the waterway's "war, strikes, terrorism, and related perils". Company officials, however, lifted the advisory in 2006, after Singapore and Indonesia launched their sea and air patrols. Pirate attacks have not stopped the 50,000 ships that annually transit the narrow passage. Forty percent of the world's trade passes through it, and it has become the most important route of transport for oil from the Middle East to markets in East Asia. According to the IMB, the majority of modern pirates in the region are of Indonesian origin. Of the countries in the region, Indonesia's navy is least equipped to combat piracy. Instances of modern piracy typically fall into one of three categories: those looking for easy profit, those working with or belonging to organized crime syndicates, and those associated with terrorist or secessionist groups with political motivations. Pirates looking only for easy profit are usually criminals of opportunity. They search for easy targets, robbing ships and their crews of money and valuables. Those belonging to organized criminal syndicates attack with more sophistication and planning. Their operations, which require skill, coordination, and funding, aim to steal large cargoes or to kidnap ships' crews for ransom. The kind of piracy related to terrorism operates similarly, but differs in that it seeks funding to continue terrorist activities or to make political statements. 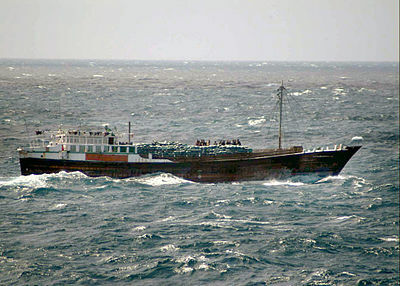 In 2004, the three countries in the region, Indonesia, Malaysia, and Singapore, increased efforts to patrol the strait in an attempt to curb piracy. While Singapore wants international support in this effort, Indonesia and Malaysia are opposed to foreign intervention. It remains to be seen whether the three countries will be able to stamp out piracy. The problem is especially acute in Indonesia. There were 325 reported pirate attacks worldwide in 2004; nine occurred in Malaysian waters, eight in Singaporean waters, and 93 in Indonesian waters. With Indonesia making it clear that it is not adequately equipped to patrol the Strait, the Indian Navy and Indian Coast Guard finally agreed to join the multinational piracy patrol in the Strait of Malacca in 2006. India is also building a UAV-patrol base in the Andaman and Nicobar Islands to monitor the Andaman Sea adjacent to the Strait of Malacca. There seems to be a failure, particularly outside the region, to recognise this change in the frequency of pirate attacks and the scale of the problem. While piracy has certainly been a concern in the waterway in the past, with reported attacks reaching seventy-five in 2000, the number of cases has been falling since 2005. ↑ 1.0 1.1 "Watchdog hails improved security in Malacca Strait; Increased patrols and other measures have cut number of pirate attacks", The Straits Times, January 23, 2007. ↑ "Shipwrecks as historical treasure trove", The New Straits Times, July 6, 2003. ↑ "A Taste for Adventure; Even the Most Familiar Jar in the Spice Rack Holds a History Of Piracy, Shipwreck and Nation-Building", Chicago Tribune, April 18, 2001. ↑ Piracy down 3rd year in row: IMB report", Journal of Commerce Online; January 23, 2007. ↑ "Pirate attacks up 14 percent worldwide in Jan-Sept period, maritime watchdog says". Associated Press. Intl Herald Tribune. 2007-10-16. Archived from the original on 2012-01-11. http://web.archive.org/web/20120111082830/http://www.iht.com/bin/printfriendly.php?id=7907480. Retrieved 2008-11-07. ↑ "The MARAD View of Maritime Piracy", presented at Piracy at Sea: The Modern Challenge. Marine Policy and Ocean Management Workshop; Woods Hole, Massachusetts. April 24, 1985. ↑ "Shipowners want better info on regional piracy", The Business Times Singapore, via shipping-exchange.com, 01-12-2006. Retrieved on 29-01-2007. ↑ "14-nation network's anti-piracy coordination centre opens here; $2.2m info-sharing centre starting next week will help joint effort to fight sea piracy", The Straits Times, via Singapore Ministry of Foreign Affairs, 23-11-2006. Retrieved on 29-01-2007. ↑ "Hard times for pirates in busy world waterway," Christian Science Monitor. October 30, 2006. ↑ "A welcome voice in a sea of chaos", Los Angeles Times, via kabar-irian.com, 13-11-2006. Retrieved on 29-01-2007. ↑ Schuman, Michael. "How to Defeat Pirates: Success in the Strait of Malacca." TIME. Wednesday April 22, 2009. Retrieved on April 22, 2009.